But darn it, downtown still deserves bragging rights for last weekend. Mom and I hit the steamy sidewalks for a little Saturday City Market on the Green shopping. Green bag in hand, we purchased homemade dog treats (Breath Busters and Snickerpoodles), a gallon of fresh homemade salsa (which, in less than a week, has been entirely consumed in Candy’s Land) and locally grown veggies. The cucumbers were chopped, marinated in Italian dressing and chilled in the fridge for a summer snack. The squash and zucchini were used in a vege-friendly pasta bake. And the green tomatoes were fried for dinner with friends earlier this week. All in all, a successful “buy local” shopping trip. What else was going on downtown was a wonder in its own right. The annual Fort Hawkins Benefit Open Car show had a traffic jam on Cherry and not a single parking spot to be found. 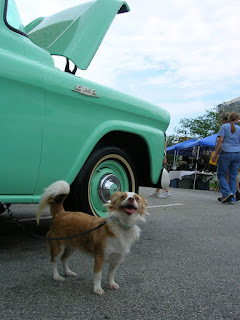 With fifties music cranking, car hoods popping and folks creating a sea on the sidewalks to gawk at the vintage vehicles, the car show had our engines humming with its impact on downtown. Mom immediately called Texas T and Bright Blue and coaxed them down from their lofts to see the virtual sock hop happening in their urban backyard. Who knew this could be so much free fun? The vintage trucks stole us girls’ hearts, so Bright Blue appropriately took a pic of me posing in front of one of my favorites. More free fun just around the block, we also caught the highspeed championship cycling event whirling around Mulberry Street’s post office. With ice cream available and a legion of fans backing their favorite cyclists, we sat for a spell and cheered on the finish line (more cowbell, please). With practically a three-ring circus taking over downtown last Saturday, Mom couldn’t help but wonder why all of the restaurants weren’t open. But at least Market City and the throng of customers were reaping the breakfast and lunch rewards. Downtown was alive and happening . . . and for a couple of free hours, you could call me a farm-fresh car and cycling enthusiasts. Congrats College Hill Corridor Commission! Mission Incredible: Need a Medic!